Security and Transparency — What Happens to the Email and Data that SaneBox Manages? In an ever-connected world, online security is vital to keeping your personal information, business details, emails, and privacy safe. Here at SaneBox, we’re committed to keeping all you and your data secure. We’re here to provide peace-of-mind and take several steps to ensure you can trust us with your information and emails. We use state-of-the-art security and backup technology to protect any data and emails you share with us. Your data is encrypted by industry-leading cryptography and secure systems. Your data is backed up regularly, both onsite and offsite. 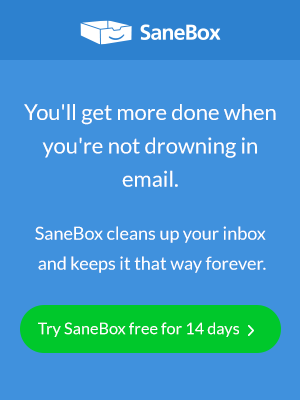 The only “part” of SaneBox that sees your email is our smart algorithms. No SaneBox employee, partner, provider, affiliate, or other third party has any access to the contents of any of your emails. The only time we may get access to your emails is if we need to provide you with dedicated support or need access to solve a problem, and even then humans will only ever look at the headers of your emails. At no point do any of the employees, or any part of the SaneBox service (including our algorithms) view the content or body of your email messages. We never move your emails off of your email provider’s server. All of our systems integrate with email servers and work with the security of email providers like Google, Yahoo, or Microsoft. Customer data is never a source of revenue for SaneBox. We never share or sell any aspect of your personal data or email information. Any personal information we collect from you is only used to manage your account and enhance the services we provide to you. You may have heard about certain issues with some email services that offer a subscription removal service selling your data. For a safe alternative to an unsubscription service, we recommend SaneBox BlackHole. Dragging an email into the SaneBox BlackHole folder securely moves your email to trash, meaning you will never hear from that sender again. This is completely safe, secure, and does not share your data with anyone. For third party site-support (e.g., Google Mail) we may have to store authorization credentials and related information for other sites. We will make it clear that we are requesting this information before you provide it and you can contact to have it removed. Data you give us permission to access (e.g., your Google Mail or Contacts). Comments you make in our forums or elsewhere on our website. We use your email address to communicate with you and to authenticate with 3rd party products integrated with our system. We will never sell or rent your email address or ANY personally identifiable or even aggregated information to another company. For diagnostic purposes, our engineers may have access to private data (e.g., to fix a problem with the website). Before gaining such access, however, they must get management approval, and we are committed to maintaining the privacy of that data. Regardless, we will not read the bodies of your email messages (we may have to look at the envelopes (To/From/Subject/Date) as part of our diagnosis, but we ignore the bodies of messages). All payments and payment information on our site is handled through Pin Payments which is fully PCI DSS compliant. PCI DSS is the global standard for safeguarding financial transaction data. No customer financial information is ever stored within our computer systems. You own the data associated with your account. And, at any time, you can securely remove your data from our servers by logging into your account and requesting such a deletion. This will be true even during a corporate merger or a corporate bankruptcy. We only access the envelope and header information associated with your emails. The actual bodies of your emails are never downloaded or accessed within our computer systems. It’s vital for our customers to trust the way we handle your information. If you ever have any questions please do contact us and we would be delighted to help.